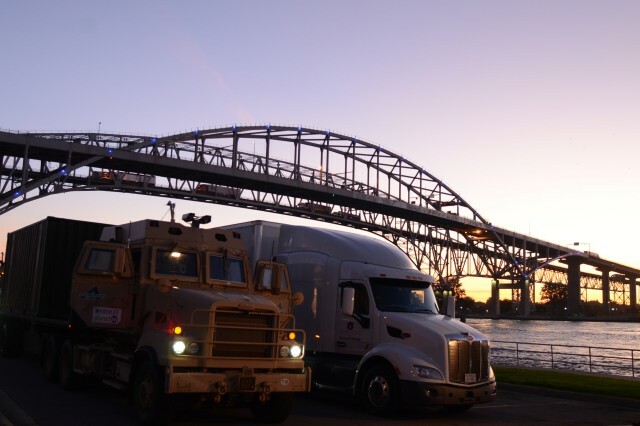 PORT HURON, Mich.--The U.S. Army Tank Automotive Research, Development and Engineering Center (TARDEC) demonstrates today its latest advancements in platooning technology, taking a four-vehicle convoy from Port Huron to Sarnia, Ontario and back across the Blue Water Bridge connecting the two cities. The international crossing is the Army's first with this technology. 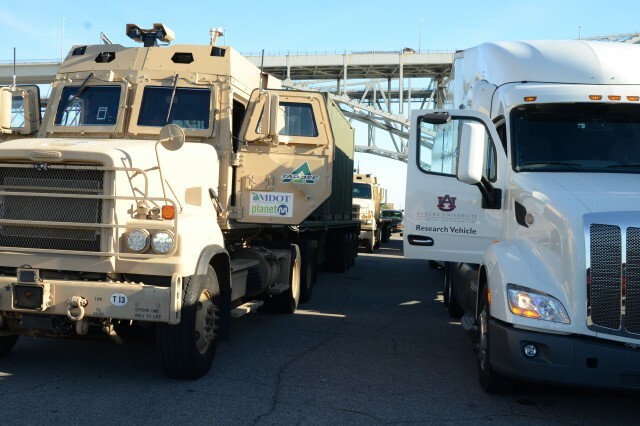 TARDEC brought these vehicles in a limited capacity to Interstate 69 in June 2016 to test their communications technology and ability to "talk" with the Michigan Department of Transportation's roadside infrastructure. The Army's vehicles in this convoy, two M915 'line haul' tractors carrying flatbed trailers loaded with cargo containers, are each equipped with TARDEC's Autonomous Mobility Appliqué System technology which enables a full range of capabilities from driver-warning features like in today's commercial automobiles to semiautonomous operation, which can move the vehicle along a path using pre-programmed waypoints. "Driverless capabilities can do so much for our Soldiers and their missions," says Bernard Theisen, project manager for the leader-follower program. "We are providing commanders with options to move Soldiers out of convoy trucks and into missions where they're uniquely suited, and this technology can significantly increase the safety for those Soldiers who perform convoy duties." 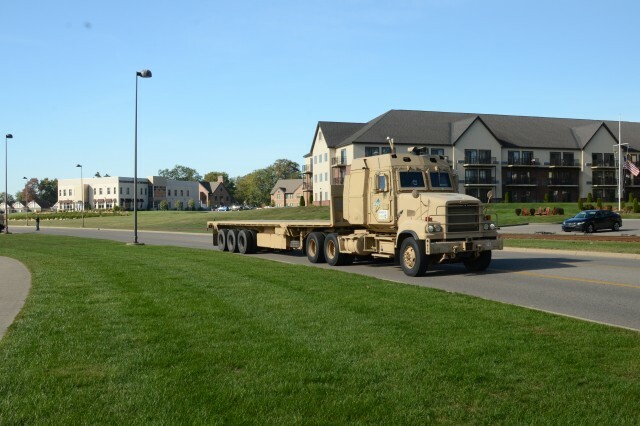 The Army's developments in platooning, or autonomous leader-follower technology, takes another step forward with the integration of non-Army, commercial vehicles. TARDEC enjoys a Cooperative Research and Development Agreement (CRADA) with the Michigan Department of Transportation (MDOT) and the Michigan Economic Development Corporation (MEDC), through the Planet M initiative. Brandon Pender, leader of TARDEC's External Business Office, says the mixed convoy represents an important dynamic to the Army. "The work we do with driver-optional technology is done with our collaborative partners in industry," says Pender. "These relationships help us advance the technology more affordably for the Army while contributing to the body of knowledge in driver-optional technology at large." On display at this demonstration are the vehicle's automated acceleration and deceleration features, which allow the vehicle to adjust its speed and braking with respect to instructions passed back to it from the lead vehicle. Additionally, the Army's trucks are enabling the automated steering feature. With this capability, the truck's computer receives information from the lead vehicles and steers the truck accordingly. This is the first time the Army has tested this capability on a public roadway, says Theisen. Among the collaborative partners TARDEC brings together are Auburn University and a tier-1 automotive supplier. "We are proud to contribute key technology and expertise to this groundbreaking demonstration as part of our longstanding partnership with TARDEC," said Chris Roberts, dean of the Samuel Ginn College of Engineering at Auburn University. "The important work Dr. Bevly and his autonomous vehicle research development team are engaged in with TARDEC will go a long way towards bringing this exciting, life-saving technology to fruition." The demonstration concludes at noon; for more information, visit www.army.mil/TARDEC or www.PlanetM.com. Headquartered at the U.S. Army Detroit Arsenal in Warren, Mich., TARDEC is a major research, development and engineering center for the Army Materiel Command's Research, Development and Engineering Command, and is an enterprise partner in the TACOM LCMC. The GPS Vehicle Dynamics Laboratory (GAVLAB) at Auburn University's Samuel Ginn College of Engineering focuses on the robust control of autonomous vehicles using GPS and Inertial Navigation System (INS) sensors along three main thrusts: sensor fusion/integration, on-line system identification, and adaptive control techniques and their application to vehicle dynamics and transportation. The research conducted at the Auburn GAVLAB is led by Dr. David M. Bevly, the Bill and Lana McNair Endowed Distinguished Professorof Mechanical Engineering at Auburn University's Samuel Ginn College of Engineering.